Paycom's future looks as bright as ever after recent comments from the company's CEO. 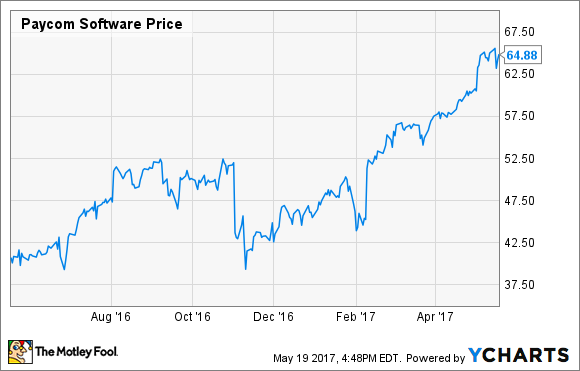 After growing its top line by more than 40% each of the past four fiscal years, Paycom Software (NYSE:PAYC) is on a roll, with its stock trading at all-time highs. Paycom's recent appearance at the Jefferies 2017 Global Technology Conference revealed a company quite optimistic about its future as well. During a "fireside chat"-style presentation, CEO Chad Richison highlighted a few factors that speak to the size of the growth opportunities still ahead for the payroll and human resources software provider. Although Paycom has long targeted clients in the 50- to 2,000-employee range with its all-in-one cloud-based software solution, Richison has also made it a habit on each quarter's earnings call to talk about client wins with larger companies. Over the past four quarters, he's announced 12 new clients with between 2,000 and 8,000 employees. Since Paycom's licensing agreements usually include an additional per-employee fee, these larger clients offer extra profit potential. After we had proven ourselves in the upmarket, it became more of a pull for the upmarket companies to call us and engage us, because they realize that what they're spending millions of dollars to create, already exists. [...] I mean I will talk with companies that have 5 or 6,000 employees and they're spending millions of dollars a year, and their employees can do three things -- they might be able to request some time off, they might even get into a benefits portal, but they're still going outside the system to do expense management and other items. [...] And so we're starting to see a pull from that market pulling us more, but we're very focused on the 50- to 2,000-employee market. Richison also stated that about half of American workers are employed by businesses in Paycom's target range. But on an annualized revenue per employee basis, he believes Paycom currently represents just 2% of the total addressable market for 50- to 2,000-employee companies. While that's where Paycom will keep focusing its sales efforts, the continued larger client wins may provide a big incremental -- and more profitable -- growth opportunity down the road. They have no reps [...] just office space. Then they start hiring, and then it takes two years for that team to really get up to speed, fully staffed with a full pipeline. While Richison says this model has been "really disruptive" for Paycom, it's helped the company consistently achieve its goals. Paycom also has an interesting strategy of not hiring salespeople from within the industry, oftentimes hiring people with zero sales experience. However unorthodox that may be, you can't argue with the kind of growth that Paycom continues to see as a result. The company plans to announce additional office openings later this year. Paycom currently has a total of 43 sales offices. Richison said that the company believes that it can eventually build that number up to 120, with the working assumption that each office can ultimately support between $6.1 million and $6.2 million in annual sales. While the scenario above is a long way off, that means Paycom believes it's capable of someday generating incremental annual sales of roughly $738 million, in addition to the recurring revenue it already recognizes from existing clients. When you consider that the company's total revenue last year was around $329 million, that's a huge runway for future growth. Paycom has been on an impressive winning streak for the past several years as its software continues to make inroads with small and medium-sized businesses. And judging from the company's most recent earnings results -- as well as the large opportunities still on the horizon -- I doubt it'll be slowing down anytime soon.